CRANES squad preparing for CECAFA Senior Challenge Cup in Kampala regroups mid next week but will be given a Christmas break on December 24. FUFA technical director Edgar Watson said that the squad of 29 players will embark on non-residential training at Namboole stadium on Wednesday. “It’s a big pool of players for training purposes but we shall pick a squad of 23 before the team goes into residential training on December 22,” Watson said. “We are yet to decide where the team will reside,” Watson explained. The team mainly comprised of home-based players will be cut down to 20 players who will be registered for the event that kicks off on December 31. Watson said players will return to camp on Boxing Day. The three top teams will get cash from the tournament sponsors GTV. This month, the annual CECAFA championship will be hosted by Uganda. The tournament, coming on the back of another failed qualification campaign by the national team, is seen as one where Cranes must impress to return hope to a fading nation.One thing that is clear is that CECAFA has proved to be a very misleading tournament for Uganda. Cranes has been the most successful team in the tournament’s history for a long period of time but this has not translated into qualification at continental level. Uganda will once again reach at least the last four of the tournament, as has been the case in the last couple of years.But the overall quality of players in the CECAFA region is too poor to improve Uganda’s ailing fortunes. 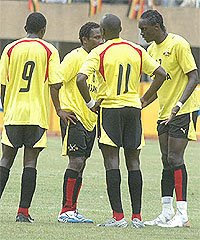 The Federation of Uganda Football Associations must start to plan for the 2012 campaign and beyond. The national team should be playing friendly matches with West African countries to fight the away phobia that has often worked against the team’s chances of qualification. As we have seen in the last couple of decades, the CECAFA tournament will not take the national team anywhere.